Recently an issue arose while retrieving files from a client. The author was sending me TIFF images for review. When I downloaded the files from DropBox they were huge. By huge I mean 11in. X 16 in., 300ppi, 52MB, RGB, TIFFs. I opened them in Photoshop, did a save-as, and sure enough the images were uncompressed. I am not going to go into a lengthy explanation of what image compression is or how it works but I do want to touch on a few important points that will make transmitting and storing your files much less cumbersome. There are two types of image compression, LOSSY and LOSSLESS. LOSSY refers to compression techniques that degrade image quality because the reduction in file size is achieved by removing image data. JPEG is an example of a LOSSY compression algorithm. LOSSLESS refers to compression algorithms that do not degrade image quality. LZW is an example of a LOSSLESS algorithm. I urge anyone that saves images as TIFFs or GIFs to use LZW compression. The one drawback to LZW is that the amount of compression varies depending on the complexity of the image. An image with a lot of white space, like a flow diagram with boxes and arrows and text will achieve a greater percentage reduction in file size than a colorful photograph of a field of flowers. This is due to the fact that LZW works it’s magic by building a table of identical pixel colors and lumping all of those pixels together to be referenced as one. So all the white pixels in the image will count as one pixel. 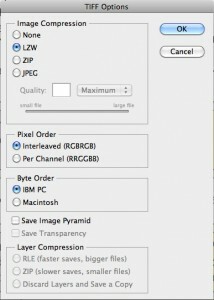 If all the pixels in the image are different colors the image reduction will be minimized. 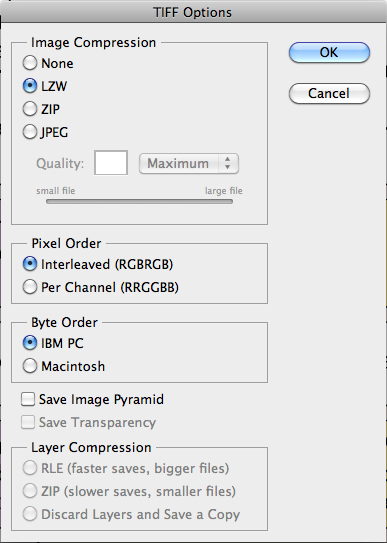 When you save your image as a TIFF in Photoshop you will see this dialogue box. Select LZW compression and you are good to go. Regarding the 52MB image file, when saved with LZW compression it reduced to 23MB without loss of quality.